iPhone 8/7 plus/ 6s , iPhone 5s users after upgrading to latest iOS 12 are not able to find the new measure app in these iPhone models. Even on iPad pro with iOS 12 the measure app is missing. 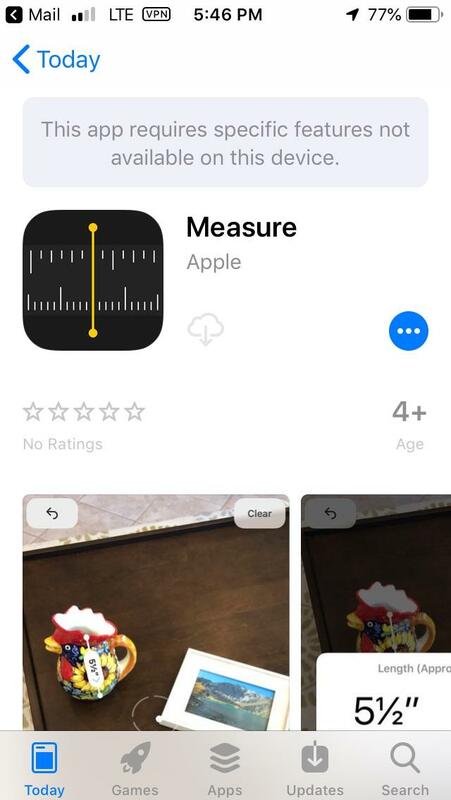 The measure app is an augmented reality app and Apple has designed this app to make it easier to measure various real-world objects using 3D spatial detection techniques using AR. Which is quite innovate and great technology from Apple. It looks like not only iPhone 7 but in some cases for iPhone 8 + the app is missing after upgrade to iOS 12. Compatibility of measure app was expected to be from iphone 5 but the Measure app is missing from iPhone 6. As communicated iOS 12, this app will work from iPhone 5, but when searched from iphone on app store, it says, 'This app requires specific features not available on this device”. This app needs augmented reality features and device supporting AR can install measure app. The iphone 6s is with AR 2.0 support device is as same as AR 1.0, which means any devices using A9 CPU and above can use the AR function and should have measure app working fine in iOS 12. Not all iPhone seems to be affected from this issue but many of iPhone 6 devices are not showing up with Measure App. The error message “this app requires specific features not available on this device” is generally shown if the device does not support the app or the application is not available in the region/country specific but not sure what went wrong in this case. Please try to install the iOS 12 in your iPhone without uploading any backup. This will eliminate any backup related issue in iPhone. Try to install the app in in fresh iOS 12. If you are still unable to access the app please contact customer care. It is observed that the Measure app is missing on the devices with faulty IC chips on the motherboard. If you have also repaired you device in past please ensure no faults still present in the device. You can ensure this by taking your device to nearby Apple customer centre. 1. Go to settings and logout from iCloud. 4. Now try to install the measure app.